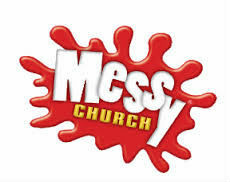 Messy Church is a fun and informal Church for families which meets once a month after school on a Thursday. A biblical theme is focused on each month, which may include Daniel and the lion’s den, Noah’s ark, who is Jesus and Christmas. There is no pressure to arrive at a set time. Families can arrive between 3.30 – 4 and engage in a lively games and refreshment time in the church; we follow this with a craft session. It is our aim for the families to take home good quality and useful crafts which include glass painting, mosaic work, cooking such as bread or making a fruit salad while also making room for more impulsive play with play dough and painting being provided. The joyful and lively songs and interactive story time in the church is very popular ensuring the children and families go home with the Bible message for that month. We finish our session with fellowship over a hot meal provided for the children and adults alike. The cakes for pudding are a lovely treat for the children (and adults!) to enjoy. All are warmly invited to come along to our FREE and fun session so you can see for yourselves how worshiping God in a family atmosphere can be stimulating and enjoyable.